What will the Queen have to say on the 8th May? 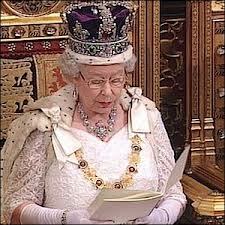 The Queen’s Speech on 8th May will set out the Government’s legislative programme for the 2013-13 Parliamentary session. So what can we expect? This will be the Coalition Government’s third Queen’s Speech and it is beginning to show. Much of the 2010 Coalition Agreement has found its way onto the statute book and its ‘mid-term review’ did nothing to replenish the well of legislative requirements which is beginning to run dry. We are also seeing legislative plans set early in the Coalition’s life running into difficulties. Party political funding reform is now off the agenda. Reforms to political lobbying and the introduction of a power to recall MPs have run into the ground. Now the legislative timetable for High Speed 2 has been pushed back so we can only look forward to a paving bill to authorise further expenditure rather than the project’s construction. This is just inevitable at this point of the political cycle as initial opportunism gives way to reality. But we are also seeing the Government avoiding the legislative tool, reflecting the philosophy of both governing parties and the realities of coalition government; with a slim majority in the Commons and the lack of one in the House of Lords, why antagonise your backbenchers, who resent the protection of the aid budget at a time when other departments are under pressure, when the UK is already meeting the target to spend 0.7% of national income on aid without it being set down in law? And why pick a fight elsewhere when there are other ways (such as statutory guidance or voluntary codes of practice) of achieving (almost) the same ends? The increasing trend of publishing draft legislation for pre-legislative scrutiny, which started under the last administration and is now well established and is set to continue. In recent weeks we have seen new draft Bills on dangerous dogs and on inheritance and we can expect more to come including on communications and broadcasting. Introducing draft legislation helps to keep restless backbenchers at bay when popular measures among their ranks, for instance the proposed ban on wild animals in circuses, are not quite ready to be formally introduced. Will this extend to a draft EU Referendum Bill? Turning to local government, the sector can most probably expect a new legal framework for the social care, legislation bringing down the curtain on the Audit Commission and replacing it with a local audit framework and new community rights for tackling anti-social behaviour. These will be familiar as they have all been subject to pre-legislative scrutiny in draft form. Given that the new EU directive needs to be implemented by December this year we are also likely to see a ‘Consumer Bill of Rights’. And in recent days, Eric Pickles has told the Society of Editors that he “will” introduce legislation in the next session giving him powers to direct local authorities to stop “politically contentious” advertising campaigns, municipal newspapers and hiring lobbyists. But will he find a willing MP to take forward, again, his hand-out bill on holding councils to account for refusing permission for local events on health and safety grounds? What will catch the national eye will be measures on cigarette packaging and smoking in cars, carrying children. But these are not certain to be taken forward. And we await the result of the reported cabinet battles on the introduction of a minimum unit price for alcohol – either way commentators will interprete the outcome as politically significant. We can expect an immigration bill breaking up the UK Boarder Agency separating out responsibilities for visas and those for enforcement. While the same Bill could be used to make it easier to deport foreign nationals who commit serious crime and to further David Cameron’s aim to make it more difficult for immigrants to access welfare benefits, housing and free hospital care. All of which will be popular on the backbenchers and difficult to oppose, given public opinion. What will be contentious will be legislation requiring internet providers to make customer activity available to the police and security and intelligence agencies. Talk is that the Liberal Democrats, and Nick Clegg, are opposed to it being taken forward. We shall have to wait and see.